Balance – a key yogic concept. Whether we’re talking about standing on one foot or bringing equality to sides of the body or practicing poses that counteract the way we hold and move our bodies while we’re working or playing off the mat, finding balance is a central element of yoga practice. Nearly everything we do in yoga seeks to find balance, whether that’s in our bodies, in our emotions, or in our life. Here’s a balance sequence that will help you stand on one leg better (balance poses improve the health and quantity of cells in the cerebellum as well as increase our longevity), find better balance between the left and right sides of the body, and leave you feeling more centered and grounded. Mental Centering: No Purna Practice would be complete without this meditation technique. Bring your mind into focus with the Mental Centering snack. Hip Opening Series: Bring balance to your hips with this, dare I say it, life-changing series. Fancy Footwork: If you’ve been in class lately, you’ve probably done this with me, as I’m always looking for ways to bring more strength and flexibility to the feet and ankles. I find this work to be invaluable when I’m going to practice balance poses. First, sit in Dandasana on whatever height is needed to keep your sacrum perpendicular to the ground. Then, keeping the legs and knees as still as possible, make circles with your feet and ankles only. Go in both directions and make your circles as big and as smooth as possible. Take your time with this and work at your edge. Second, come on to your hands and knees and bring your feet and ankles together as much as possible. Curl your toes under and sit back on your heels. Use blocks under your hands to help take the weight off your feet if this is too, shall we say, intense. Scoot your knees away from your feet if it’s too easy. Hold for six to nine breaths. Third, come forward again onto your hands and knees again. Keep the feet and ankles together as much as possible and point the toes backwards. Then, sit on your heels again. Hold for six to nine breaths. Do three reps of each direction total. Adho Mukha Svanasana: Focus on making both sides of your waist long as you stretch your hips away from your hands. Bring equal weight to both hands and to both feet. Trikonasana: Focus on making both side waists equally long as the bottom one tends to get short in this pose. Lift the rear leg hip bone away from the front leg inner heel to open across the pelvis. This opening will come in handy for Vrksasana (Tree Pose). Vrksasana: Find your gazing point (drishti) to keep your focus and your balance. Remember that the foot can go anywhere on the standing leg but on the knee joint. Lift the pit of your abdomen, externally rotate the thigh of the lifted leg, and move the lifted leg glute underneath you to keep it active. Keep working that opening of the hips by moving the hip bone of the standing leg away from the lifted leg knee. Keep your hands at your hips, or bring them to your heart, or even take them overhead. 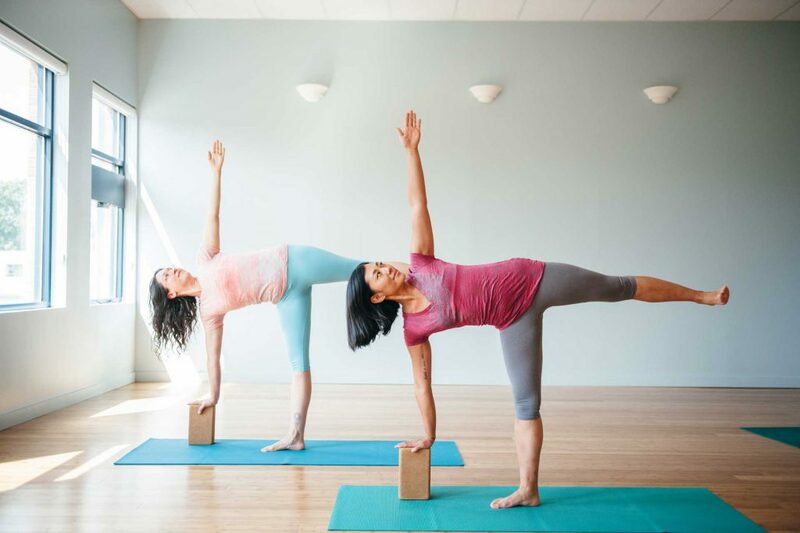 Ardha Chandrasana (Half Moon Pose): A balance pose in more ways than one, this pose gets its name because one of its benefits is the way it soothes menstrual cramps and PMS when done throughout the month. Points to keep in mind: the standing leg knee points at the center of the standing foot to keep the knee happy and tracking; keep the standing leg sitting bone, center of the knee and center of the heel in the same plane; lift the raised leg hip bone away from your standing leg heel; keep the side waists equally long. Garudasana: The pose pictured at the top of this post. Wrap the arms first. Lift your sternum and spread your shoulder blades. Whichever arm is on top, the opposite leg will be on top. If you can hook the foot, fantastic! If not, keep hugging your thighs together, lift the pit of the abdomen, and remember to keep the standing leg bent. It’s not supposed to be straight! Adho Mukha Svanasana: Counter-balance from all those right/left poses with this one-side, stabilizing pose. Shavasana: Rest. It’s one of the best ways we can balance out our busy lives. Enjoy! Let me know how this sequence makes you feel in the comments.